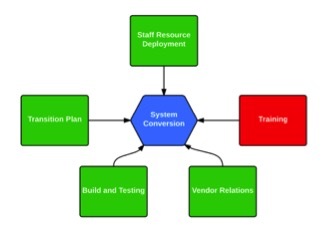 This article reviews the points to consider for Training for each type of conversion. Your organization must clearly define the resources needed to be assigned to the conversion or upgrade project. All three types of conversions have similar training requirements, but there are specific points to consider for each type of conversion. Often a weak point with system upgrades. The stakeholders need to clearly understand the content and impact of the upgrade on your system and organization. Sources of information include upgrade documentation from the vendor plus insight from the vendor consultant (hold them accountable for this information). Tip Sheets – Documented tip sheets outlining the impact of the upgrade. Distribute the tip sheet through clinical leadership to review with the respective staff members (great agenda item for the staff meeting). Effective tool with an upgrade. The training encompasses a review of the look of the application, functionality, and workflow changes. Measure and document competency on the system for all users. Vendor lead “Train the Trainer” program for select hospital employees responsible for training the hospital team. Ensure there is a cross-section of users and analysts selected for the training. This includes pharmacists, nurses, therapists, lab, IT analysts, IT leadership, physicians, and quality/compliance. These “super-users” become the core build team and/or upgrade team. Classroom learning – taught by vendor or a hospital employee who completed a “Train the Trainer” program from the vendor. Upon completion of the training, document that the user has completed the training including requisite competency testing as appropriate. Many hospitals will not give a user login credentials until the user demonstrates completion of the training. Train the builders/testers to the level of “super user.” This is the time to enroll end users in the training/building/testing. This improves adoption and advocacy for the new application/platform. Tip Sheets – Documented tip sheets outlining pointers to system use. Distribute the tip sheet through clinical leadership to review with the respective staff members (great agenda item for the staff meeting). Measure and document competency on the system for all users. As mentioned above, some hospitals require the user to be “signed off” on the training before access to the new system is granted.